This Thursday, rock n’ roll author Jim Dawson joins me LIVE to discuss his new book “Rock Around The Clock”, which traces the origins of the hit song. Did you know that “Rock Around The Clock” was spliced together from 2 unusable takes and then thrown on the B side of Haley’s 1954 flop, “Thirteen Women” (which I love, by the way)? 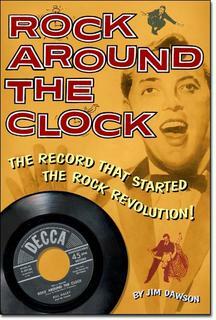 Jim actually pinpoints the true beginnings of “Rock Around The Clock” back to the mid 20s. He’ll fill ya in and we’ll even hear many of the evolutionary recordings that led up to this ground breaking song, this Thursday @ 8pm EST/5pm PST on The Night Prowl Show. Here is the Legendary B.B. King with Matt The Cat in the XM Satellite. Here I am with the Legendary Willie Nelson. This pic was taken just a few days ago in the satellite. I’m the one without the braids.